It's been a while since the last Retro F1, and the next is happening this weekend. It'll take place this Sunday, at 1500 (3pm) GMT. And given that Tuesday next week marks the 30th anniversary of the untimely passing of Gilles Villeneuve, I've decided to make this Retro F1 a tribute to the great Canadian. 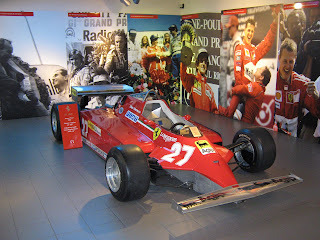 We'll therefore be watching the 1981 Monaco Grand Prix, one of Gilles Villeneuve's best ever drives. Retro F1 is where we watch a classic F1 race in full on YouTube, and everyone can post updates and chat about it on Twitter as live. And this race will be a very good watch. The only drawback is that the only link I can find has German commentary - but I'm sure we'll be able to work around that! The link we'll be using to watch the race is here, and you can follow and contribute to the chat with the Twitter #retrof1 hashtag here. It will be great if you can watch along with us and have some Twitter chat as we go. The Retro F1 events we've done so far have been really enjoyable with lots of welcome insight and contributions on Twitter from a wide range of people watching along. Please let me know any questions or comments you have via the comments below or on Twitter. I'm also happy to hear requests for future Retro F1 races to watch, though bear in mind it needs to exist in full (and for free) on the internet. And it seems if anything to be getting harder to find such races online - Bernie's no doubt going round looking for copyright infringements.